A website that reveals corruption and other scandals among high-ranking Kenyan politicians has become one of the country’s most-visited addresses ahead of the 2013 elections. MaVulture.com, which means big or many vultures in English-soaked Swahili slang Sheng, publishes alleged wrongdoings of Kenya’s political class. Since its launch on November 13, the latest project by Nairobi based activist Boniface Mwangi has become one of Kenya’s most popular websites. With Kenya’s general elections ahead in March, MaVulture so far features profiles of 17 politicians. Among them are prominent figures like Uhuru Kenyatta, the son of Kenya’s first president, a current presidential candidate, and also one of the men wanted by the International Criminal Court for crimes against humanity during the 2007 post-election violence. Financed by anonymous doners, MaVulture exposes money laundering, land grabbing, drug trafficking and murder, to name only a a few of the accusations. Aside from articles, the site includes videos, infographics on each politician and Wild-West-style wanted posters available for download. Also stencils are available for download. In June, Mwangi led a rally that carried 49 black coffins to the Kenyan parliament while PMs were in session. Each coffin was to represent one year that politicians have enjoyed impunity since Kenya’s independence in 1963. 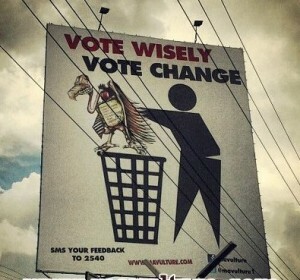 Activists labeled all coffins with a political scandal and stenciled “Bury the vulture with your vote” on them. According to Transparency International’s 2012 corruption perception index, Kenya scored 27 out of 100 for perceived corruption, with 100 being clean. Overall, Kenya was ranked place 139 out of 174 countries. Transparency International estimates that corruption costs Kenya up to 357 million dollars annually. 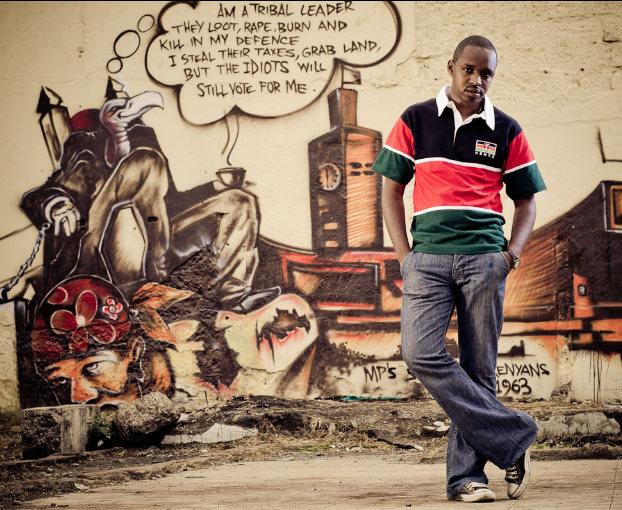 Read a portrait of Boniface Mwangi and Nairobi’s revolutionary graffiti scene in The Guardian.